July Pawsomebox Unboxing Video - Reclusive Fox ""
I am so sorry I am late in publishing this post. July rushed by in a blink of an eye didn’t it? Anyway, I am here now and today the dogs and I finally had a look inside the July Pawsome Box. Have a watch of our unboxing video if you want to see how the dogs react to all the goodies inside. If you’re not a fan of watching videos I’ll give you a quick rundown of the goodies inside. Trixie Multi vitamin paste – We’ve had this before in another box and the boys both loved it. Although it’s a supplement both Floyd and Booker saw the paste as a little added treat. 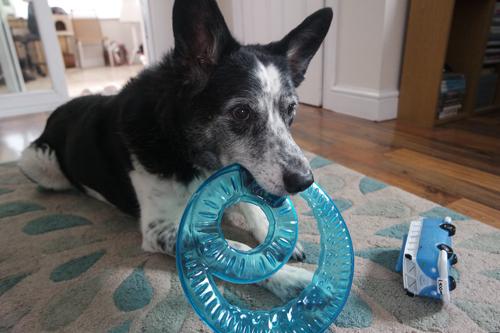 Georplast Frizbee – This looks amazing fun for the dogs and we’ll certainly make use of it on our walks. It’s raining at the moment though so it will have to wait. Camper van squeaky toy – Both dogs will love this and I will be happy when the squeaker dies! Georplast collapsible bowl – I love that Pawsome box continue to put in useful items like this. We’ll use it on our long walks to ensure the boys don’t get dehydrated as we roam the hills. Mutt & Jeff Sausages – Both dogs enjoyed these small sausages and they will be useful treats when good behavior requires rewards. Happy Pet Pork Bone – This is going to be fantastic for keeping Booker occupied when I am working away. I doubt Floyd will get much of a look in but that’s okay as he is very sensitive to foods. Yet another amazing box from Pawsome Box. If you’d like to give them a try please visit their website and check out the different subscription options. Don’t panic though, you can cancel your membership very easily if you wish or if you simply want to treat your dogs every once in a while. Booker and Floyd are sent the Pawsomebox but their opinions and views are their own, as are mine. Looks like you got some amazing stuff! I’ve got 4 pooches and I know they’d love something like this! These boxes sound great for dogs although I am not a fan of squeeky toys! I’m not either! That will be one for outside, or I will break the squeaker, I’ve been known to do that on several occasions. Aren’t I a spoil sport.